Waste management is subject to increasingly broad and demanding legislation - which includes a strict penalty system - both in Spain and in Europe. We often forget that green spots, eco-parks, recycling centres, dumps or collection centres, not to mention management facilities authorised to store hazardous and non-hazardous waste, are also greatly affected by this situation and are subject to the requirements of Law 22/2011 on waste and contaminated soil, Royal Decree 110/2015, on waste electrical and electronic equipment (WEEE) or Royal Decree 180/2015, which regulates the transfer of waste, among others. Unlike other storage and waste management facilities, many of these eco-parks are in remote locations and suffer from a lack of adequate infrastructure (such as aconnection to the Internet or telephones). They may even be affected by casesof vandalism. Hard physical environment: These centres are normally to be found in remote locations, with large areas open to the elements, a constant toing and froing of vehicles and trucks and an important movement of waste. Difficulty in recording data: The lack of time and the absence of staff dedicated exclusively to welcoming users, together with the disparity of the waste thatis received in a green spot, make it very difficult to register data in aunified way. Difficulty in extracting information: The fact that this register is insufficiently unified or indeed incomplete makes for a very complicated task when it comes to standardising the information, extracting data sets, drawing up statistics and generating reports and indicators. Difficulty in complying with regulations: Chronological file management, preparing theannual report and registering data on the waste electrical and electronicequipment (WEEE) received, among others. Mandatory communications: Telematic communications must be sent both to the Autonomous Communities and, in a short period of time, to the platform of the Ministry of Agriculture and Fisheries, Food and the Environment (MAPAMA) to report on the traceability of WEEE, and the Annual Report must be prepared and delivered eachyear. Vandalism: There are parallel networks of illegal waste management that, among other problems, distort indexes and statistics on recycling, particularly in those cases in which the waste that is deposited is not strictly controlled. Visibility and awareness: Many citizens do not know of the existence of eco-parks and recycling centres or prefer to deposit their waste in green, blue or yellow kerbside waste containers. Mobile application: A mobile device and a compact ticket printer are provided. The device connects to the printer via Bluetooth, thereby avoiding the need for cables. This modality is ideal for operators in recycling centres who can’t spend a lot of time in their hut or office and who have to assist users on thesite. Touch desktop application: The device includes a console with a touchscreen, a ticket printer and an ID card reader. Compact in size, it can be placed on a table or desk in the hut or office. Both applications can operate without a connection to the Internet and, when they do have a connection, they send the entries recorded to cloud-based software that unifies and aggregates the information, making it possible to generate reports and to check a chronological archive. With Teixo GP and their web access, the owner of a recycling centre or the facility operator will be able to comply with the regulations and obtain operational reports and reliable statistics. TeixoGP is designed to be integrated with other tools, for example, to send data to other reporting tools, reduce fees or promote incentive policies (such as the “Tropa Verde” environmental responsibility platform). 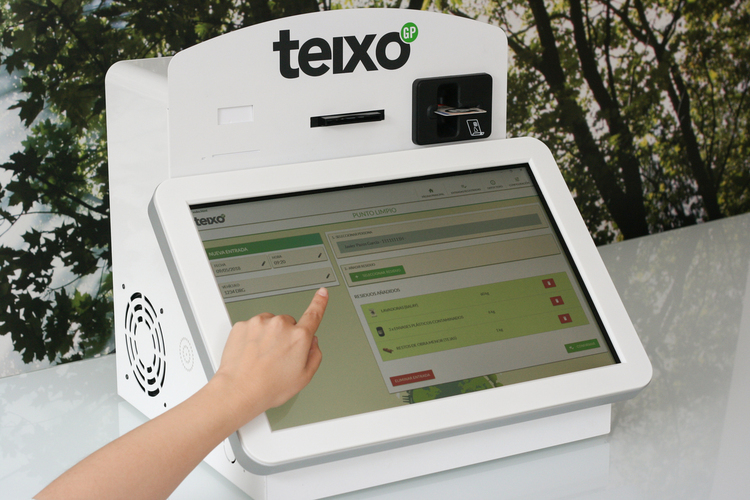 Many recycling centres in several cities are already using Teixo GP. With a low implementation cost and a rental service, TEIXO GP controls the management of your recycling centre in real time and it can also be used in mobile or temporary facilities or for specific campaigns. It promotes compliance with the regulations,streamlines management and the information obtained by using this technological tool is of great help when it comes to developing action plans.